Tulsi Gabbard offers progressive platform at campaign kickoff. Hawaii Congresswoman Tulsi Gabbard officially kicked off her presidential campaign Saturday with an ominous message about an increasingly dangerous world in which the United States sits on the “precipice of nuclear war” amid worsening international tensions. Star-Advertiser. 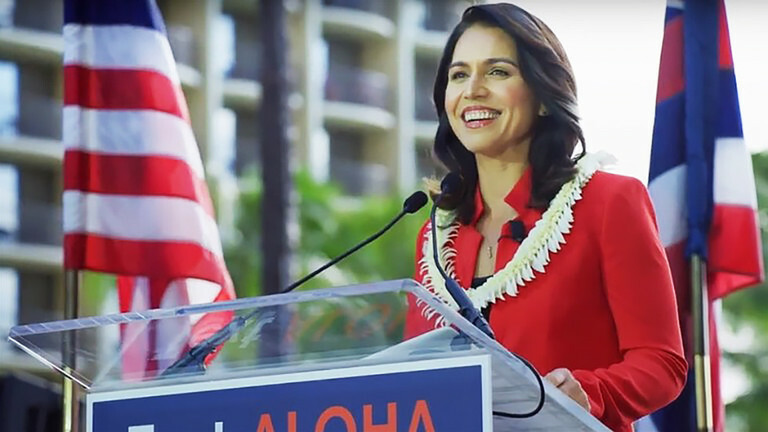 Tulsi Gabbard On Running For President: ‘We Must Fight For The Soul Of Our Country’. The U.S. representative from Hawaii held her first public rally on Saturday in her quest to win the White House in 2020. Civil Beat. In front of scores of supporters in Waikiki on Saturday and with hundreds more watching online, Congresswoman Tulsi Gabbard officially kicked off her 2020 presidential campaign, saying that she wants to “build a movement of peace at home and abroad that will fulfill the promise of America." Hawaii News Now. Congresswoman Gabbard calls on supporters to join her in her bid for the presidency. KHON2. Tulsi Gabbard officially announces 2020 presidential run. She is entering a crowded race for the presidency. KITV. VIDEO: Tulsi Gabbard Kicks Off 2020 Presidential Campaign. Big Island Video News. Tulsi Gabbard’s foreign policy stance sets her apart in crowded field. Star-Advertiser. Tulsi Gabbard Kicks Off 2020 Campaign With $2 Million In The Bank. The Hawaii congresswoman will need to raise a lot more if she expects to compete with Democrat heavyweights such as Elizabeth Warren, who reported having $11 million in cash on hand. Civil Beat. The push to legalize pakalolo is building strong momentum this year, with more than two dozen state lawmakers introducing legislation to allow its recreational use by Hawaii adults. Star-Advertiser. Hawaii lawmakers kill plan to lower voting age. A key Senate committee scuttled a plan to allow Hawaii residents to begin voting in state and local elections when they reach the age of 16 but is moving forward with proposals for automatic recounts in close races along with another plan for statewide voting by mail. Star-Advertiser. Hawaii businesses looking to go green could get some help installing electric vehicle charging stations. Hawaii Energy and Ulupono Initiative are offering a limited-time rebate for installing or upgrading to EV charging station at workplaces and multi-unit dwellings. Hawaii News Now. Kauai, Big Island Mayors Dubious About Raising Minimum Wage. Honolulu’s mayor supports the pay increase, but leaders of islands hit hard by disasters last year say now is not the time. Civil Beat. Looks Like We’ll Still Be Using Private Prisons On The Mainland For A While. Legislative leaders who are trying to solve Hawaii’s prison crisis say it’s unrealistic to think we can move hundreds of inmates back here anytime soon. Civil Beat. A bill wants to ban plastic rings that connect multiple cans of beverages. The legislation also intends to fine companies that make the rings. KITV. Lawmakers introduce new bills to combat ticket scalpers and bots. KHON2. Counterfeit coffee: Senate bill to re-introduce mandatory certification for green advances. Clearing the Senate Committee on Agriculture and Environment, Senate Bill 869 came one step closer Friday to reinstating a mandatory certification process for green coffee coming out of the state. West Hawaii Today. Honolulu City Council members have submitted their list of candidates to temporarily fill the District IV seat currently left vacant while a special election is pending. The council will be holding a public hearing on Monday, February 4, to consider names that have been submitted by the council members. KHON2. Homeless flock to rest stop but few use social services. The number of homeless adults, children and pets using the city’s Punawai Rest Stop, a “hygiene center” in Iwilei, has steadily grown in less than a month of operation — from eight people on the first day to 174 on Thursday. Star-Advertiser. A largely deserted piece of the former Barbers Point Naval Air Station in Kalaeloa is being prepared for re-population as part of a plan to build the first new homes in the area since the military base closed in 1999. Star-Advertiser. A $2.08 million project to address cliff erosion and rock slides along two makai portions of Diamond Head is set to begin Monday. Star-Advertiser. Many chafe at tourism growth. Once a secret spot for locals, Laie Point isn’t the most welcoming place for tourists. Star-Advertiser. Higher-than-expected levels of the chemical chlordane in the soil beneath the former Henke Hall have delayed construction of the new Life Sciences building at the University of Hawaii at Manoa by nearly a year, and raised the cost of construction by nearly $4 million. Star-Advertiser. Commentary: Wild attacks on high court could backfire on Trevor Ozawa. Star-Advertiser. Mayor Harry Kim signed a proclamation Friday announcing the county’s commitment to eliminating all traffic deaths and serious injuries on island roads. Tribune-Herald. Property tax changes coming. Eliminating the solar water tax credit, reclassifying small agriculture lots to residential and repealing an obsolete program are three ways the county could generate revenue and make its property tax code more equitable, according to a report to be considered next week by the County Council. West Hawaii Today. A public meeting will be held Wednesday in Hilo on a proposed spaceport. The informational open-house is part of the environmental assessment process for the small satellite launch facility the Alaska Aerospace Corp. is seeking to build on W.H. Shipman land. Tribune-Herald. Big Island lawmakers have renewed their efforts to secure lifeguards for Kua Bay in North Kona. Two bills have been introduced in the Senate and another bill in the House to fund lifeguards at the popular beach site. West Hawaii Today. A state Senate committee advanced bills Friday in support of a new boat ramp for Puna and demolition of the former Uncle Billy’s Hilo Bay Hotel. Tribune-Herald. Hu Honua Bioenergy faces more litigation, while construction of its biomass power plant near Pepeekeo falls further behind schedule. Tribune-Herald. Hart to divest stake in company before joining mayor’s staff. Deputy planning director hopes to take up his new post mid-February. Incoming Deputy Planning Director Jordan Hart has not yet taken his position in the Michael Victorino mayoral administration as he works to divest himself of the company his father founded, which is involved in land-use planning and landscape architecture. Maui News. Two more directors pass muster in council panel. Pearson for water, Teruya for finance are recommended. Maui News. A council committee on Friday advanced recommendations in support of Jeffrey Pearson as director of the Department of Water Supply, and Scott Teruya as director of the Department of Finance. Maui Now. Maui’s Mahi Pono to offer lots to local farmers. The company that bought a vast expanse of land in Central Maui from Hawaii’s last sugar cane plantation plans to kick off its new operations by offering lots to local farmers to grow their crops. Associated Press. ‘Hope and skepticism’: Mahi Pono reaches out to community. Mahi Pono officials making rounds; details about who they are beginning to emerge. Maui News. Tearing up over famous onion’s end. Maui Pickled Products has sent its last shipment . Maui News. Hawaii may become the first state in the nation to get a new type of ground-based missile interceptor — in addition to the powerful $1 billion radar that’s already in the works — to better protect against North Korean missile attack. A long-awaited Missile Defense Review recently released by the Pentagon calls for the Missile Defense Agency and the Navy to study the viability of “operationalizing” the Aegis Ashore missile defense test site on Kauai, either temporarily or permanently, with interceptor missiles. Star-Advertiser. Home sales up, Realtors cautious. The total number of properties sold last month on Kauai is slightly higher than a year before, but some Realtors are saying those numbers are not necessarily a positive sign. Garden Island.